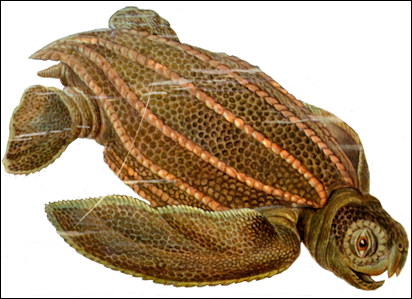 No one known how long leatherbacks live. Based on growth layers in the bones that encircle their pupils it could be 30 years before they reach maturity. A leatherback hatchling is smaller than a child's hand when it hatches, yet it grows to a length of six feet and can weigh over half a ton. It flippers can stretch 10 to 15 feet. A male leatherback found washed up on a beach in Wales in 1988, was 9 feet, 5½ inches long and weighed 2,120 pounds. There are Atlantic and Pacific subspecies or species. Killer whales are one of the few creatures that are known to feed on leatherback turtles. Leatherback turtle expert: Scott Eckert, Hubbs-Seaworld research Institute, San Diego CA. Websites and Resources on Coral Reefs: Coral Reef Information System (NOAA) coris.noaa.gov ; International Coral Reef Initiative icriforum.org ; Wikipedia article Wikipedia ; Coral Reef Alliance coral.org ; Global Coral reef Alliance globalcoral.org ; Coral Reef Pictures squidoo.com/coral-reef-pictures ; The Global Coral Reef Monitoring Network; the International Coral Reef Action Network. The leatherback differs from all other turtles in that it is protected by a large leathery sheath of cartilage, with the texture of smooth, hard rubber, rather than a conventional shell. The sheath is comprised of interlocking coin-size plates of bone that may compress at extreme depths. The teardrop shape of the sheath and keel-like ridges ease flow across the sheath that merges almost seamlessly from the turtles neck and thick shoulders. Leatherback turtle ribs and vertebrae are not fused to the cartilage as is the case with normal turtles and their shells. The hundreds of bony plates that make up the sheath are imbedded in the skin and impregnated with oil that helps make them waterproof. Their back is brownish black with white speckles. Their flippers have no claws. Leatherback turtles have a large head and a short, thick neck. 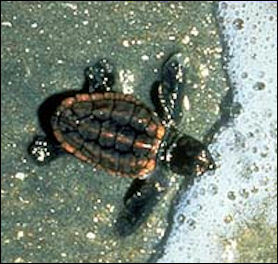 Each turtle has a pinkish spot on its forehead. No one is sure what this spot does. Some refer to it as a “third eye” because a stalk from the turtle’s brain extends just below the spot, where the skull is at its thinnest. It is thought that the spot receives signals of some sort. Studies have shown that leatherbacks swim almost constantly, both day and night, at an average speed of 1½ mph. They often dive for jellyfish. In the middle of the day they often swim about two meters below the surface, deep enough to avoid surface wave action and shallow enough to absorb the sun’s rays. Some scientist believe they use the sun to orient themselves when swimming to a new feeding site. Leatherbacks are the deepest diving of all turtles. They can dive to 3,900 feet. Farther than even sperm whales go, and hold their breath for more than an hour. When they dive a sphincter closes off the blood flow to the lungs, conserving energy. The cartilage sheath (its “shell”) compresses under pressure and doesn’t crack as a shell on other sea turtles would. Leatherbacks can endure long periods of time in water that is 12 degrees F colder than their body temperature. They can do this because they have the ability to regulate their body temperature. Cold blood returning from the flippers is warmed by outgoing blood before reaching the body core. In very cold water blood flow to and from the flipper surface may shut down intermittently. The leatherback’s large size, thick outer layer of fat, also helps it generate and retain heat. Put you hand on a leatherback’s shoulder and it feels warm to the touch, unusual for a reptile. In an experiment, scientists placed a leatherback in ice and found that it recovered quickly. Leatherback blood hold large amounts of oxygen because it has more red blood cells than any other reptile. The heart is particularly large with an unusual shutting arrangement which allowed partially oxygenated blood to bypass the lungs, which need to stay compressed in long dives, to deliver more oxygen to the muscles. Leatherback turtles feed almost exclusively on jellyfish. 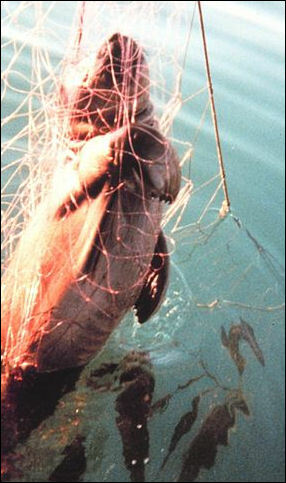 They play an important ecological role by eating jellyfish that feed on the fry of tuna and swordfish and other fish. They usually feed at the surface but are capable of making deep dives. Autopsies of dead leatherbacks have revealed they have huge stomachs, often filled with masses of relatively low-calorie and mostly-water jellyfish, stingers and all. Massive salt glands collect excess salt from the jellyfish and excrete it as viscous tears. A favored prey is the lion’s mane. Among the largest jellyfish, it can weigh more than five kilograms. Leatherback turtles, sunfish and some other species have backward-pointing pharyngeal "teeth" at the back their throats that prevent slippery prey from sliding back out their mouths. After swallowing a jellyfish they regurgitate it against these teeth, which strains out the water and leaves behind the edible material which is swallowed and digested. Jellyfish offer little nutrition and sustenance. Like pandas eating bamboo, leatherbacks have to eat a lot of jellyfish and spend a lot of time eating it to get enough calories to power their large bodies. By some estimates leatherbacks need to eat their weight in jellyfish every day to get the nutrition they need. One turtle video taped devoured 60 lion’s mane jellyfish in three hours. Males spend all of their lives in the open sea and very little is known about them. Females are smaller. They come ashore on average once every three years to lay their eggs. They usually arrive in the beaches on dark, moonless nights to avoid being detected. Most leatherback turtles nest on beaches off tropical or sub tropical waters. Major nesting sites for Pacific leatherbacks are found in Costa Rica, Mexico, Malaysia and Indonesia. Major nesting sites for Atlantic leatherbacks are along the northern coast of South America and in the Caribbean. 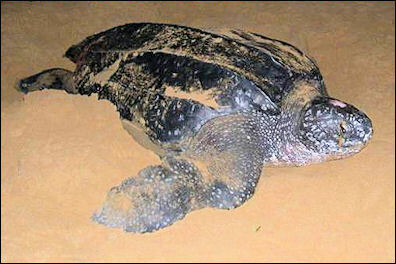 Male leatherback turtle sometimes attempt to mate with females just coming from their nesting beaches. Sometimes the females return to their nesting sites 10 days after the eggs are laid. Sometimes females coming ashore and those returning to see after laying their eggs collide on the beach. Each is so purposeful it refuses to give away, with each pushing forwards until enough of an angle emerges to allow them to wedge past each other. The shells of leatherback hatchlings are covered with small, pearly scales that disappear after a period of time. As is true with other sea turtle species, the chances of a leatherback turtle egg producing a mature adult are very slim. Crabs, herons, birds, racoons and even jaguars feed on eggs and hatchling on land and predator fish wait for the hatchling offshore when they enter the water. People collect the eggs in spite of laws preventing them from doing so. David Attenborough wrote: "With her immense flippers, she heaves herself up the wet sand. Every few seconds she stops and rests. It takes her half an hour or more to climb to the level she seeks, for the nest must be above the reach of the waves yet the sand must be sufficiently moist to remain firm and not cave in as she digs. Then she determinedly starts clearing a wide pit with her front flippers, sweeping a shower soft sand behind her. After a few minutes work, it is deep enough, and with the most delicate movements of her broad back flippers, she scoops out a narrow shaft in the bottom." "She sheds her eggs quickly, in groups, her back flippers clasped on either side of her ovipositor, guiding the eggs downward. As she lays, she sighs heavily and groans. Mucus trickles from her large lustrous eyes. In less than half an hour, all her eggs are laid and she carefully fills it in, pressing the sand down with her hind flippers. She seldom returns directly to the sea but often moves over to other places on the beach...to confuse her trail. Certainty, by the time she heads back to the waves, the surface of the beach has been so churned up that it is almost impossible to guess just where her eggs lie." leatherback range and nesting sites Leatherback turtles are the most widely distributed and migratory of all reptiles. They spend nearly all of their time in the open sea. They have adapted to both Arctic and tropical waters. They can swim 22mph and have been seen as far north as the Aleutian Islands and as far south as Tasmania. Leatherback turtles are the only reptiles that qualify as warm blooded. They are usually found in warm water but they can range into cold waters in high latitudes because of their ability to generate body heat. This is achieved with a high metabolic rate, two kinds of fat and sophisticated heat-exchange system. See Leatherback Characteristics Above. 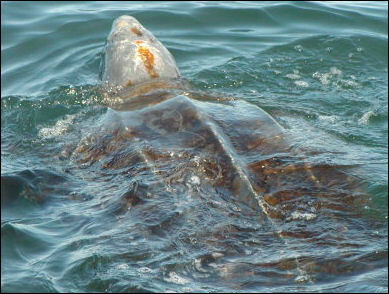 Tagged Leatherback turtles have been tracked migrating 7,000 miles to feed, mate and lay eggs. Turtles from Samoa have swum across the Pacific Ocean to California in almost a straight line. Leatherbacks also have been tracked traveling between New Guinea and costal California and Oregon, perhaps as often once every three years. One leatherback was tracked migrating from nesting sites in the French Guiana and Suriname area in northern South America to the west coast of Africa and then north to the Azores. Another was tracked traveling 6,000 miles from a feeding site off of Newfoundland to the Mid Atlantic Ridge then to waters off Suriname and north to Trinidad, possibly to nest, and then to feed on jellyfish in the Grand Bank off of New England. Leatherbacks must lay their eggs in warm sands. They migrate to cold far away waters to feed on jellyfish. In recent years leatherbacks have been showing up more in waters that were regarded as too cold for them such as off Nova Scotia. Baby leatherback The number of nesting female leatherback turtles in the Pacific Ocean has declined from 90,000 in 1980 to only 4,000 in the mid 2000s. Mexico was once thought to have the world’s largest leatherback population, with around 75,000 nesting females, in the 1980s. A beach in Mexico called Mexiquillo that once welcomed 1,500 leatherback a year now receives less than half a dozen. Similar reports have been filed from nesting sites in Central America and Malaysia. The International Union for the Conservation of Nature lists leatherbacks as critically endangered. Their numbers are rising into the Atlantic Ocean but declining or fluctuating alarmingly in the Pacific Ocean. The total number of nesting female counted in Trinidad and in the Caribbean is between 20,000 and 60,000 with 10,000 to 25,000 more on the west coast of Africa, while the number on the Pacific side of Central America is only 300 to 3,000, with around 2,000 to 6,700 in New Guinea and Samoa and 1,300 to 2,500 in Southeast Asia. Leatherbacks die in collisions with ships, are entangled in fishing nets, drowned in plastic bags, choked on plastic objects, slaughtered for meat, and consumed as eggs regarded aphrodisiacs. Tourist harass them when they lay their eggs. They beaches that used for nesting sites have been developed with hotels and condominium. In the 1970s and 80s Matsura Beach in Trinidad was littered with turtle carcasses and peppered with holes dug may egg poachers. Leatherback turtles are being killed in large numbers by industrial fishing primarily by being accidently hooked with long lines or accidental drowned in commercial gill nets. They are attracted by the lights attached to longlines and become entangled in the lines or get their flippers snagged on the hooks and drown unless they can get to the surface to breath. By one estimate over 100,000 miles of long lines, with 4.5 million hooks, rip through the Pacific Ocean every day. The most dramatic declines have occurred in the Pacific. Using satellite tags scientists discovered that leatherback turtles that nested in Mexico and Costa Rica migrated south, where they were vulnerable to being snagged by drift nets set off Peru and Chile. By one estimate 2,000 to 3,000 leatherbacks were killed a year by these drift nets in the 1980s and early 1990s. 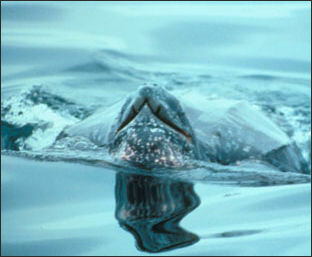 Leatherbacks have also been hurt by the collapse of the anchovy fisheries off Chile and Peru connected with El Nino years. Scientists have found that the number of turtles that show up at nesting sites falls off markedly after El Nino years. Even in good years researchers are finding that females in the eastern Pacific are smaller, nest less often and produce fewer eggs than leatherbacks in other areas. Efforts to help leatherbacks has included protecting their nesting beaches, restricting harmful fishing practices and calling on a variety of spirits and deities to help them. Scientists study them by attaching satellite transmitters and identifying tags to females at their nesting site and putting packages of instruments that stick to the carapaces of leatherbacks for a few hours at their feeding sites. It is hard to develop a strategy to protect leatherbacksbecause they range over large areas of the oceans and do not stick to narrow migration routes. At some leatherback nesting sites hatcheries have been set staffed by people who collect the eggs and put them out of harm’s way. To save the leatherbacks in Malaysia the eggs are gathered shortly after they are laid and placed in protective pen. Sometimes the turtles are allowed to grow some before they are released so they have a better chance of survival. Leatherback turtles in the Caribbean and the Atlantic have rebounded perhaps in part thanks to efforts to protect their beaches and regulate fisheries in the Atlantic Ocean. Groups like Nature Seekers patrol beaches where leatherbacks nest and keep an eye out for poachers. Conservationist are trying to get fishermen to use shallower nets that ensnare less turtles without compromising their fish catch. 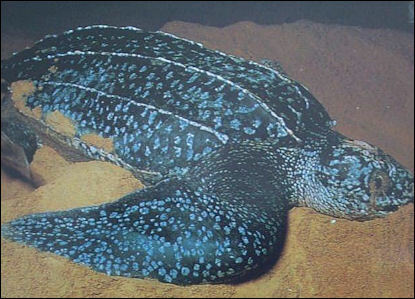 In Trinidad leatherbacks have made a spectacular come back. On Matsura Beach the number of nesting females has increased from a few hundred in the 1990s to perhaps 3,000 in the late 2000s. On kilometer-long Grande Riviere sometimes 500 leatherbacks show up each night. Elsewhere on the island leatherbacks are nesting in beaches that were empty a few ears ago. Altogether about 8,000 female leatherbacks nest on Trinidad, There are so many that local fisherman consider them a pest. But something more is going on that just conservation because many of the sea turtles that are returning were born before the conservation efforts began. Scientists think the main force behind their strong comeback is their ability to swim in cold water and reach dense jellyfish populations and feast on a food source that few other marine creatures can tolerate. Many are feeding on the huge swarms of jellyfish that appear off Nova Scotia, where some think the increase in jellyfish is tied to the decline of big fish linked with overfishing. Text Sources: Mostly National Geographic articles. Also the New York Times, Washington Post, Los Angeles Times, Smithsonian magazine, Natural History magazine, Discover magazine, Times of London, The New Yorker, Time, Newsweek, Reuters, AP, AFP, Lonely Planet Guides, Compton’s Encyclopedia and various books and other publications.